The gold filament stitching and the back stitching in green are completed. I found a few more spots here and there where I missed stitches so I fixed those spots. Getting off facebook and watching documentaries apparently is good for my stitching mojo as I actually get some things done! My goal this evening was to finish up the stitching with the dreaded gold filament because I dislike stitching with that stuff so much! The documentary on the Vietnam War that I was watching was still playing so I kept going with the back stitching of the pine needles on two of the ornaments. 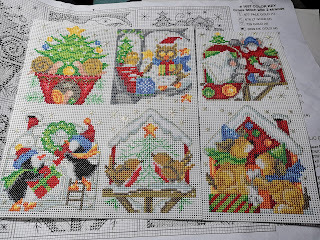 The outlining in black and the red beads are all that remain to do now. Thank you! I have been lacking in my participation in the TUSAL. Many apologies. Now that I am stitching again, I hope to have something to contribute to the TUSAL.